This page tells how I feed my dogs. There is also a little bit information about their health and its treatment regarding feeding and homeopathy. My old feeding habits are in its own page. There is also told how the feeding affected my dogs and what kind of problems they had. 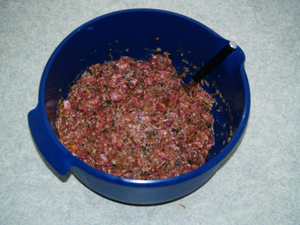 In this page contains also a little bit information about raw feeding and collected information to solve problems. I haven't wrote basic information about the BARF feeding (raw feeding), because the internet is full articles of BARF. There are few links at my links-page to another BARF sites. There are more and more people who wish to feed their dogs with raw food. People have realized problems with in their dogs and are willing to get more information about feeding. Raw food has helped so many and words get out. When I feed my dogs with raw food (meat, fish, vegetables, fruits and bones) I know exactly what's in the dog's plate. The good thing is also that you can affect to the content 100 %. There are situations in life when nutritional value changes: stress, infections, old age, allergy, cancer etc. You can highlight those parts in food what are more important at that time (like vitamin C). Diversity is important in food. A lot of dogs who are fed with industrial food, they get only one kind of food and before long they refuses to eat. When serving a different meats, dogs not only like their food, but gets all important ingredient at same time. Industrial food have become better and better. And I'm sure that in the future there are good, healthy foods at market. But even then we are talking about industrial food. Mom makes the best food itself, not from market freezer� Why dogs wouldn't deserve the same? A lot of people think that feeding raw food (BARF) is hard and risky. There are always risks but no more when feeding raw or industrial food. Check where you purchase your meats. But you have to remember that raw food is not a miracle. It cannot fix any sickness, only help dog's system to deal with it. Of course there are a lot of problems that can be solved with right kind of feeding program, example food allergy and skin problems. You have to remember that if your dog is allergy to pork, then it's also allergy raw pork! Anyway, you can make food from the ingredient that fits to your dog. If you want to feed your dog with raw food, you better read a lot about it! Or at least is safer to have a person who can guide you making a menu to your dog. You can raise your dog to un-healthy with raw food as you can with industrial food. No food quarantines 100 % healthy and problem free result. But I'm sure raw food is the best way to go. BARF is an abbreviation from the words Bones and Raw Food. 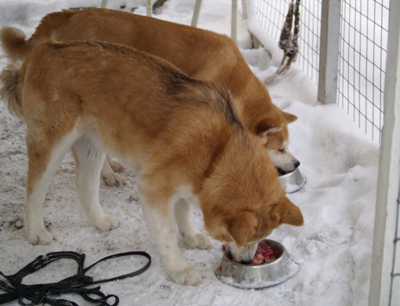 Practically this means that the dogs are fed with raw and fleshy bones, meat, fish, vegetables and fruits. Vegetables and fruits are given that the food would dissolve easily in the stomach. For example wolfs get vegetables etc. from eating a rabbit. The vegetables are also important because of the vitamins. This aim of BARF is to feed the dogs by giving food that they would eat if they were free in nature. Industrial dog food and other similar products don�t fill this criterion. The way the dogs are fed affects many problems. If the feeding is wrong it can for example cause leakage of the eyes and allergies. Many people (including me) also feed porridge and home food to dogs. Although those do not include the BARF feeding habbit. The most important thing is to follow your dog, if he/she feels fine then everything is alright. Do what is best for your dog. Food amount to adult dogs are calculated from breed's ideal weight. Puppy's food amount is 10 % of its 7-10 weeks weight. A puppy eats same amount of food as a puppy and an adult. Food is given 4 times in a day to a puppy and 2 times to an adult. An adult food amount is 1,5 - 4 % from the ideal weight. Most important is follow your dog and its well-being. If your dog's weight increases or decreases a lot the amount of food is wrong. If the dog needs a lot of energy, better way is increase fat and feed big portions. Here are two examples of food amounts. The result is divided to feeding times. Normally the result is divided into 2. The amount contains all, meat, bones and purees. A puppy gets food 600 g in a day. One meal amount is 150 g.
An adult gets food 600 g in a day. One meal amount is 300 g.
I don't feed my dogs perfectly following the regulations of BARF. I add grains and leftovers from human food to the BARF food. The bones section in the BARF diet circle is at least 60 %, 20 % meat and 20 % puree. I don't obey that rule literally. I feed mainly meat and some bones. The dogs get puree occasionally. Often meat contains also bones. I sometimes replace bones with egg shells. When I go to a cabin or somewhere where is hard to make food or there are no freezers, I buy dog food from a market. MEAT: I use many meats. Normally the food is turkey and chicken. I'm trying to give fish and liver ones a week. I take two different meats off the freezer at evening to melt over night. And in the morning I mix them, add some oil etc. and give it to the dogs. BONES: Mainly the bones are chicken wings, necks and spine. I also use turkey bones and rarely reindeer bones. PUREE: Sometimes I give puree a lot and then some times weeks gets by with no puree. I'm trying to give puree at least ones a week to dogs. Mainly puree is mainly made of green vegetables. Berry's and root vegetables are also added occasionally. Puree is made of apples, arctic lettuce, broccoli, cauliflower, cucumber, banana and carrot. ADDS: Daily I add linseed oil or salmon oil. Weekly or rarely I give also seaweed, vitamin B, garlic, fish liver oil, zinc, magnesium, lactic acid product and rosehip powder. Sometimes I also add an egg, cottage cheese and sour milk. I have also made monthly porridge to the dogs. It is made of millet, buckwheat, dark rice and barley. Dogs love it. In the end of year 2007 I gave first time pork entrails. Dogs liked it very much, but Martta "blow up" at once. Clearly pork is not good to Martta. Her intestine was "on fire". Homeopathy was really helpful. And of course I didn't give more pork to her. I have been treading my dogs with homeopathy and it has been worked so well, that I won't use any other way no more. Homeopathy has helped with Juno's hormone problems and Martta's intestine problems. Akita has a thick coat so warm summer can be quite hot to it. At hot weather dog looses lot of nutrient and needs rest and water more than usually. Good way to help dogs is to put an powder to their drinking water. I use powder called Nutrisal. You can also soak Nutrisal into glass of water and mix it with food. It is also good to soak food and puree with lot of water. Then the food is not too dry. You can also freeze food with lot of water and let dogs eat the icy food. It is same time fun and dogs get more water and cool food. At winter dogs need more energy, especially kennel dogs. Feed greasier food at winter. Dogs will need more fat when living outside at cold, but they don't need to be fat. Water is difficult to give because it freezes over. Add as much water as you can to food. I try to raise all my litters and their mothers with raw food. I hope that every new owner who gets a puppy from me is willing to feed the same way. I'm not against industrial food, but I see raw as a better choice. It is good to put raw meat and industrial food. Usually food tastes better. Health results have been good when fed raw food. Problems can come along when puppy grows. I'm here to help as much as I can to solve any problems. When puppy leaves to its new home it is not ready. I can not know what ingredient doesn't suit for him/her. That is the owners to find out. Money is also the thing what wonders people. Feeding raw food doesn't cost more than feeding good industrial food. Of course, this makes more work to do, but usually dogs love raw more. What wouldn't you do for your dog� I think I spend about 60 euros to dog food in a month and I feed 2 Akitas for that prize. The chance can be made at once or slowly. Some dogs don't get any symptoms when chancing at once and others have so symptoms even 4 months after. Usually the symptoms are toxic like diarrhea, throwing up and feeling bad. Other's bodies go throw a bigger process when cleaning up. Don't be afraid if your dog looks worse than before. Simplest start is to buy a few meats to freezer, few green vegetables and small bones. It is also good to buy some oil (organic) and vitamins in an organic form. Remember that vitamin A and D are grease-soluble and you can get overdose with them. The same time new, raw food menu is started, it is good to keep a diary of the dog. Write down everything you give your dog, how it is doing now and in the evening. Write down everything you notice. This how it's easier to find out if something isn't good for your dog. There are BARF forums and listings available. It's good to register to some forum etc. and get help and information regarding raw feeding. Make the puree from lighter ingredients: salads, carrot, apples, cucumbers, cauliflowers, etc. Do not put strong taste/smell ingredients like banana, cabbage, pineapple etc. Lack of calsium or wrong consistency (calsium-phosphorus). Add calsium (chicken wings) to food. Give at least one meal in a day wings. Lack of vitamin D. Produces problems with bones. Vitamin D helps calsium to infiltrate. Gall and liver disfunctions prevent vitamin D to inflitrate. Lack of vitamin C. Helps bones to develop together with vitamin D3. Is caused by some basic ingredient probably. Breeds with long hairs in their face. Cut too long hairs off. Sugar loves yeast.. Almost all berries, fruits contains sugar. Make puree from green vegetables only. Copper dyes. Among other things liver, salmon and corn contains copper. Copper is needed and the lack of it can cause anemia and diarrhea. Usually is caused by environment; lack of sun in the winter. In this case the pigment recover by the summer. Add iodine and iron to food. Seaweed contains both. Before starting to feed BARF you should read more of it. Make sure you know what you are doing, especially if your dog has some illness, allergy etc.